Peel and finely slice the shallot. Wash the cherries and remove the stalks. Cut the cherries in half and remove the stones. Heat a frying pan and add a little olive oil. Colour the slices of duck breast for 1 minute on each side. Remove from the pan and place on a sheet of baking parchment and set aside. Add the chopped shallots to the same frying pan and add a pinch of fleur de sel and sweat for 1 minute. Add the honey and the halved cherries. Remove from the heat, season with salt and pepper. 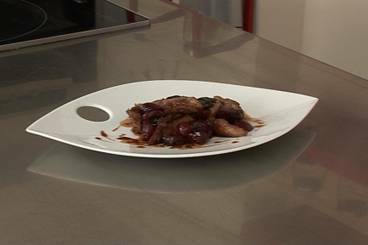 Serve the duck breasts with the shallots and cherries.